Maysie Strang was born about 1903. Maysie Strang was married to James Stewart Baxter around 1930. Mary Wood was born around 1920. Mary Wood was married to C. Stuart before 1945. Mary Stuart nee Wood was married to William Henderson Baxter after 1945. [S308] Certified Copy of a Death Certificate given at the General Register Office, Extracted from Scotlandspeople.gov.uk - Aug. 2008 (No Image) 394/00 0102 1989 age 75. C. Stuart was born around 1915. C. Stuart was employed as Chemist in Perth. C. Stuart was married to Mary Wood before 1945. C. Stuart died in 1945. Alexander M. Robertson was born in 1900, Calculated from stated age on Gravestone. Alexander M. Robertson was married to Margaret Jessie Baxter about 1928. 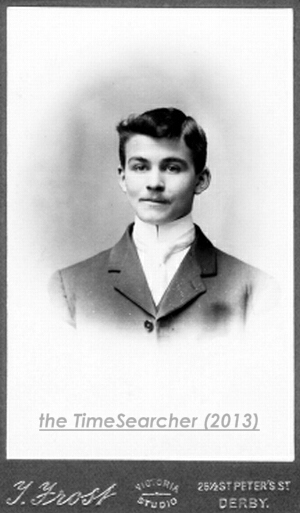 Alexander M. Robertson was employed as G.P. at Bridge of Earn, Perthshire. Medical Officer to Perth Prison. Radiologist at Perth Infirmary in around 1960. Joseph Jackson, son of John Jackson and Mary Keeling, was born in Alvaston, Derbyshire, about 1823. John Bull, son of John Bull and Mary Ann Housley, was married to Hannah Tipper, daughter of Thomas Tipper and Sarah Bull, on Thursday, 10 October 1878 at St. Chad's Church, Longford, Derbyshire. John Bull, son of John Bull and Mary Ann Housley, died about 1909,"at his daughter Alice's wedding, in 1904, he is NOT described as 'deceased.8'"
[S1861] The 1861 U.K. Census was taken on the night of 6/7 April 1861. PRO Ref: RG9 Piece: 2519; Folio: 50; Page 18; Schedule 23. [S1871] The 1871 U.K. Census was taken on the night of 1/2 April 1871. PRO Ref: RG10 Piece: 3596; Folio: 46; Page 13; Schedule 67. (Details Researched and Extracted by Martin Jackson on 9 October 2017). [S201] Certified Copy of a Marriage Certificate given at the General Register Office. Register Entry #222. [S351] Date & Place details extracted from the "Derbyshire Registrar's Marriage Index" held by the Derbyshire Family History Society. DFHS Ref. No. Ashbourne LGD/01/111. She was Baptised on Sunday, 25 April 1858 in St. Chad's Church, Longford, Derbyshire . Hannah Tipper, daughter of Thomas Tipper and Sarah Bull, was married to John Bull, son of John Bull and Mary Ann Housley, on Thursday, 10 October 1878 at St. Chad's Church, Longford, Derbyshire. 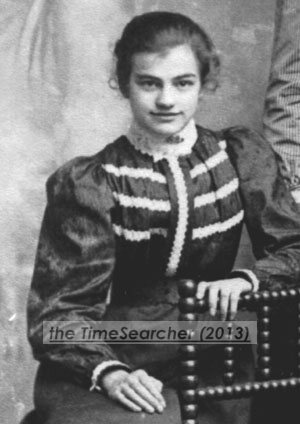 She was buried in Municipal Cemetery, Stapenhill, Burton Upon Trent on Monday, 15 March 1909. [S107] General Register Office - Index of Births, Q1 1858 Ashbourne 7b 444. [S1871] The 1871 U.K. Census was taken on the night of 1/2 April 1871. PRO Ref: RG10 Piece: 3596; Folio: 47; Page 15; Schedule 76. In the U.K.Census of 31 March 1901, John was recorded as residing at The Bothy, Calwich, Staffordshire. In 18 March 1916 John Thomas Bull served as a soldier in the Canadian Expeditionary Force. Attestation Paper for Canadian Over-Seas Expeditionary Force - 946814 - Name - John Thomas Bull; Where Born - Derbyshire, England; Next of Kin - Mrs L I Bull; Address of N of K - 1708 - 26th. Ave. E. Calgary; D of B - Mar 8th 1882; Trade - Locomotive Fireman; Married - Yes; Apparent Age - 33 yrs 2 mths; Height - 5' 7 1/4 ins; Chest measurement - Girth - 36 1/2" - Range of Expansion - 3" ; Complexion - Dark; Eyes - Gray; Hair - D. Brown; Church of England - Yes. Thomas Jackson and Alice arranged a Reunion for Grandma's Brother and Sister and their Spouses in Ebenezer Cottage, Hollington, Derbyshire. It was attended by 14 other Cousins and Spouses, including John, Lucy, Rebekah and James. [S107] General Register Office - Index of Births, Q2 1882 Derby 7b 520. [S1901] The 1901 U.K. Census was taken on the night of 30/31 March 1901. PRO Ref: RG13 Piece: 3238; Folio: 74; Page 11; Schedule 12. [S1911] The 1911 U.K. Census was taken on the night of 2 April 1911. PRO Ref: RG14PN20378 RG78 PN1221 RD429 SD1 ED23 SN101. [S308] Certified Copy of a Death Certificate given at the General Register Office, copy of Death Certificate held by Martin Jackson. In the U.K.Census of 31 March 1901, Rebekah was recorded as residing at 492 Stanton Road, Stapenhill, Derbyshire. In the U.K.Census of 2 April 1911, Rebekah was recorded as residing at The Mount, Kingsworthy, Winchester, Hampshire. Anecdote around 1920 "Albert and Becky Osman lived in Bay Road, Larne, Co. Antrim. He was Chief Steward for Sir Thomas Lipton, Tea Magnate and of International Racing Yacht fame." [S107] General Register Office - Index of Births, Q4 1884 Ashbourne 7b 666. [S1901] The 1901 U.K. Census was taken on the night of 30/31 March 1901. PRO Ref: RG13 Piece: 2647; Folio: 63; Page: 5 ; Schedule 25. [S1911] The 1911 U.K. Census was taken on the night of 2 April 1911. PRO Ref: RG14PN6109 RG78 PN282 RD103 SD1 ED6 SN137. [S1] "Personal Research of Martin F.Jackson", between 1980 and 2019. ( Ireland, Civil Registration of Marriages Index, 1845 - 1958 ). [S1939] U.K. 1939 Register Transcription for England & Wales, Ref: RG101/2311I/018/5 Letter Code: ECUT. Schedule: 257 Sub-Number: 1. [S1939] U.K. 1939 Register Transcription for England & Wales, Ref: RG101/2311I/018/5 Letter Code: ECUT. Schedule: 257 Sub-Number: 2. [S109] General Register Office - Index of Deaths, Q3 1969 Southampton 6b 1678 (Stated date of birth 14 October 1884). Thomas Clark was born in Stapenhill, Derbyshire, about 1832, Estimated from stated age on 1881 Census. Thomas Clark was married to Eliza Stanton nee Bull on Tuesday, 15 January 1867 at St. Chad's Church, Longford, Derbyshire, Entry #169 - Thomas Clark, aged 30 years, a Bachelor, Labourer of Longford, son of Thomas Stone, Labourer was Married after Banns to Eliza Bull, aged 22 years, a Spinster of Longford, daughter of George Bull, Labourer. [S1881] The 1881 U.K. Census was taken on the night of 3/4 April 1881. PRO Ref: RG11 FHL Film 1341818 PRO Ref RG11 Piece: 3421; Folio: 33; Page 20. John Bull, son of John Bull and Ann Holloway, was born in Longford, Derbyshire, in 1824. He was Baptised on Sunday, 16 January 1825 in St. Chad's Church, Longford, Derbyshire . In the U.K.Census of 6 June 1841, John was recorded as residing at Scropton, Derbyshire. John Bull, son of John Bull and Ann Holloway, died on Tuesday, 18 September 1900, in Hollington, Derbyshire,"age 76 of Cardiac Failure, reported by John Tipper, Nephew, who was in attendance. #288, Copy of Certificate held by mfj. ", he was survived by his wife Mary Ann Bull nee Housley.10 John Bull was buried in The Churchyard, Longford, Derbyshire, on Saturday, 22 September 1900. Anecdote was described by Arthur Bull, in 1982, " he lived at The Gables, where Mrs Austin used to live, he had 40 acres down Shirley Lane as well as his Carrier business, went to Derby on Tuesdays and Fridays with a van, journey took 3 hours." 1874 Wright's Directory of Derbyshire Hollington Carrier - Bull, Jno. to Derby, Tu. & F.
[S1841] The 1841 U.K. Census was taken on the night of 5/6 June 1841. PRO Ref: HO 107 / Piece: 182 / 2; Folio: 12; Page: 9. [S1851] The 1851 U.K. Census was taken on the night of 29/30 March 1851. PRO Ref: HO 107 / Piece: 2146; Folio: 98; Page 24; Schedule 90. [S1881] The 1881 U.K. Census was taken on the night of 3/4 April 1881. PRO Ref: RG11 FHL Film 1341818 PRO Ref RG11 Piece: 3421; Folio: 45; Page 15. [S1891] The 1891 U.K. Census was taken on the night of 4/5 April 1891. PRO Ref: RG12 Piece: 2751; Folio: 38; Page 15; Schedule 99. 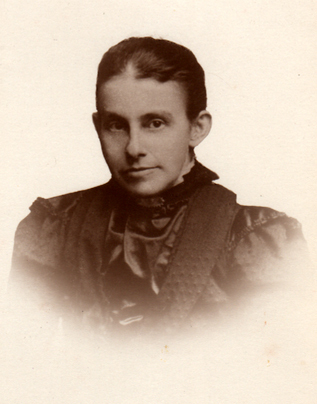 Mary Ann Housley, daughter of Joseph Housley and Alice Berrisford, was born in Monyash, Derbyshire, in 1826. She was Baptised on Sunday, 20 August 1826 in St. Leonard's Parish Church, Monyash, Derbyshire . In the U.K.Census of 6 June 1841, Mary was recorded as residing at Monyash, Derbyshire. Mary Ann Bull nee Housley, daughter of Joseph Housley and Alice Berrisford, died on Sunday, 3 March 1901, in Hollington, Derbyshire,"age 75 years, of Syncope, Mitral Regurgitation and Obstruction (Thrombosis). Widow of John Bull, reported by Mary Bull, daughter of Shirley, who was in attendance at the Death. #331. "9,10 Mary Ann Bull nee Housley was buried in The Churchyard, Longford, Derbyshire, on Wednesday, 6 March 1901. Monumental Inscription - 'Heart - very sudden.' #1327 - Mary Ann Bull, M.I. [S1841] The 1841 U.K. Census was taken on the night of 5/6 June 1841. PRO Ref: HO 107 / . [S109] General Register Office - Index of Deaths, Q1 1901 Ashbourne 7b 407. He was Baptised on Friday, 29 March 1793 in St. Andrew's Church, Cubley, Derbyshire . John Bull, son of Samuel Bull and Hannah Faulkner, was married to Ann Holloway, daughter of George Holloway and Rebecca Yates, on Tuesday, 6 April 1813 at St. Chad's Church, Longford, Derbyshire. St. Chad's Church Marriage Register Entry - "Entry #5 - John Bull of this Parish and Ann Halloway of this Parish were Married in this Church by Banns this 6th. day of April 1813 by me W.J.Beer, Curate. He was buried in All Saints Churchyard, Brailsford on Tuesday, 15 May 1855. (Re-research of this record undertaken and image of Register Entry downloaded by Martin Jackson on 21 April 2018). [S1841] The 1841 U.K. Census was taken on the night of 5/6 June 1841. PRO Ref: HO 107 / Piece: 181 Book 9; Page 11; Folio: 9. [S1851] The 1851 U.K. Census was taken on the night of 29/30 March 1851. PRO Ref: HO 107 / Piece: 2146; Folio: 24; Page: 2 ; Schedule: 6. [S109] General Register Office - Index of Deaths, Q2 1855 Ashbourne 7b 287. Ann Holloway, daughter of George Holloway and Rebecca Yates, was born in Hollington, Derbyshire, in 1789. Ann Holloway, daughter of George Holloway and Rebecca Yates, was married to John Bull, son of Samuel Bull and Hannah Faulkner, on Tuesday, 6 April 1813 at St. Chad's Church, Longford, Derbyshire. In the U.K.Census of 30 March 1851, Ann was recorded as residing at Hollington, Derbyshire. She was buried in All Saints Churchyard, Brailsford on Thursday, 30 November 1876. [S1851] The 1851 U.K. Census was taken on the night of 29/30 March 1851. PRO Ref: HO 107 / Piece: 2146; Folio: 103 p.34; Schedule 135. [S1861] The 1861 U.K. Census was taken on the night of 6/7 April 1861. PRO Ref: RG9 Piece: 2519; Folio: 49; Page 15; Schedule: 7. [S109] General Register Office - Index of Deaths, Q4 1876 Ashbourne 7b335 age 88. William Bull, son of Joseph Bull and Katherine Bakewell, was born in Cubley, Derbyshire, about 1712. He was Baptised on Wednesday, 29 June 1712 in St. Andrew's Church, Cubley, Derbyshire . William Bull, son of Joseph Bull and Katherine Bakewell, died in October 1764, in Cubley, Derbyshire. He was buried in St. Andrew's Church, Cubley on Sunday, 28 October 1764. [S1009] Bishop's Transcripts of Parish Records held at County Records Offices,. [S335] Heather Eaton, "Derbyshire Burial Index", Owned and Maintained by Heather Eaton. Mary Goodall was born about 1720. Joseph Bull, son of Robert Bull and Ann Bowyer, was born in Cubley, Derbyshire, about 1679, possible place of Birth - Parents lived in the Parish. Joseph Bull was left a Widower at the age of 41, on the death of his wife, Katherine in October 1720 in Cubley, Derbyshire. [S9] "Personal Research of Nevil Horsfall", between 1980 and 2001. [S335] Heather Eaton, "Derbyshire Burial Index", Maintained by Heather Eaton. Katherine Bakewell was born about 1685. Katherine Bull nee Bakewell died in October 1720, in Cubley, Derbyshire, she was survived by her husband Joseph Bull. Robert Bull, son of Robert Bull and Katherin Stronginarm, was born in Cubley, Derbyshire, about 1653, possible place of Birth - Parents lived in the Parish. Robert Bull, son of Robert Bull and Katherin Stronginarm, died on Sunday, 1 May 1712, in Cubley, Derbyshire. Robert Bull was buried in St. Andrew's Church, Cubley, Derbyshire, on Tuesday, 3 May 1712. [S1006] Parish Register & Monumental Inscription..
[S1] "Personal Research of Martin F.Jackson", between 1980 and 2019. ( Derbys C.R.O. ref 1178A/PF1-2 ). Ann Bowyer was born about 1650. Robert Bull, son of Thomas Bull and Margaret, was born in Cubley, Derbyshire, in 1613. He was Baptised on Tuesday, 1 October 1613 in St. Andrew's Church, Cubley, Derbyshire . Robert Bull was married to Margaret about 1640. Robert Bull, son of Thomas Bull and Margaret, died in November 1703, in Cubley, Derbyshire. (Details extracted by Martin Jackson in 1980). Margaret was born about 1620. Margaret was married to Robert Bull about 1640. Margaret died before April 1652,", date assumed from Husband's 2nd. Marriage." She was buried before April 1652. Katherin Stronginarm, daughter of Anthony Stronginarm, was born about 1608. She was Baptised in 1608 in St. Andrew's Church, Cubley, Derbyshire . Thomas Bull, son of Thomas Bull and Ellen Plymmer, was born in Cubley, Derbyshire, in 1581. He was Baptised in October 1581 in St. Andrew's Church, Cubley, Derbyshire . Thomas Bull was employed as Shoemaker. in 1600. Thomas Bull, son of Thomas Bull and Ellen Plymmer, died in February 1653/54, in Cubley, Derbyshire,"Source - John Horsfall." [S1851] The 1851 U.K. Census was taken on the night of 29/30 March 1851. PRO Ref: HO 107 / Parish Register researched at Derbyshire Record Office at Matlock 7 Aug. 1985. Margaret was born in Cubley, Derbyshire, about 1588, estimated from stated age at Burial. Margaret died in March 1663/64, in Cubley, Derbyshire,"age 66?" She was buried in The Churchyard, Longford on Wednesday, 4 February 1852. [S107] General Register Office - Index of Births, Q4 1849 Ashbourne Vol: 19 Page:330. [S109] General Register Office - Index of Deaths, Q1 1852 Ashbourne 7b 275. Mary Bull, daughter of John Bull and Mary Ann Housley, was married to Joseph Bull, son of George Bull and Jane Fearn, on Monday, 6 February 1871 at St. Chad's Church, Longford, Derbyshire. St. Chad's Church Marriage Register Entry - "Entry #189 - Joseph Bull, age 20, a Bachelor, a Labourer of Hollington, son of George Bull, deceased, was Married after Banns to Mary Bull, age 19, a Spinster of Hollington, daughter of John Bull. 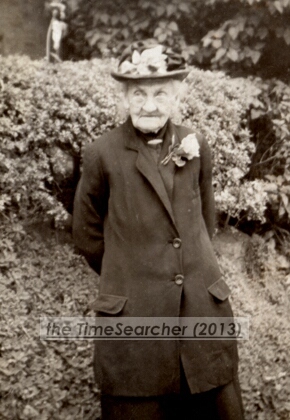 Mary Bull was employed as Laundry maid at Osmaston Manor, compulsorily retired at age 72. in 1924. She was buried, Shirley on Saturday, 17 March 1945. [S107] General Register Office - Index of Births, Q3 1852 Ashbourne 7b 465. [S120] Martin Jackson has included these details by using information from other resources:- DoB extracted from the 1939 Register Image and Transcription. [S1881] The 1881 U.K. Census was taken on the night of 3/4 April 1881. PRO Ref: RG11 Piece: 2765; Folio: 30; Page: 1 ; Schedule: 5. [S1891] The 1891 U.K. Census was taken on the night of 4/5 April 1891. PRO Ref: RG12 Piece: 2753; Folio: 78; Page: 4 ; Schedule 17. [S1901] The 1901 U.K. Census was taken on the night of 30/31 March 1901. PRO Ref: RG13 Piece: 3237; Folio: 67; Page: 1 ; Schedule: 1. [S1911] The 1911 U.K. Census was taken on the night of 2 April 1911. PRO Ref: RG14 PN21022 RG78 PN1254 RD437 SD1 ED9 SN94. [S109] General Register Office - Index of Deaths, Q4 1932 Ashbourne 7b 692 age 82. [S1939] U.K. 1939 Register Transcription for England & Wales, Ref: RG101/5931A/006/18 Letter Code: RCAK. Schedule: 43 Sub-Number: 1. [S109] General Register Office - Index of Deaths, Q1 1945 Ashbourne 7b 885 age 92. She was buried in St. Chad's Church, Longford, Derbyshire, on Thursday, 23 May 1861. [S107] General Register Office - Index of Births, Q1 1861 Ashbourne 7b 454. [S109] General Register Office - Index of Deaths, Q2 1861 Ashbourne 7b 313 aged 4 m.
Thomas Bull was a witness at the marriage of William Wood Wright and Emma Bull on 6 July 1891 in St. Chad's Church, Longford, Derbyshire; Entry #278 - William Wood Wright, 23, a Bachelor, a Blacksmith, of Wolferton, Norfolk, son Edward Wright, a Blacksmith was Married after Banns to Emma Bull, 23, a Spinster of Longford, daughter of John Bull, Farmer. 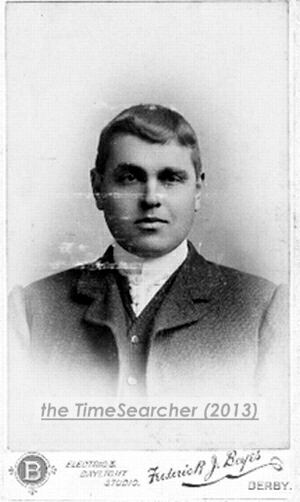 Thomas Bull, son of John Bull and Mary Ann Housley, was married to Elizabeth Leason, daughter of Joseph Leason and Sarah Heath, on Wednesday, 18 November 1891 at St. Mary's Church, Marston on Dove, Derbyshire. Palmer's Directory of Derbyshire. 1895. [S107] General Register Office - Index of Births, Q2 1862 Ashbourne 7b 471. [S108] General Register Office - Index of Marriages, Q4 1891 Burton 6b 658. [S1901] The 1901 U.K. Census was taken on the night of 30/31 March 1901. PRO Ref: RG13 Piece: 3264; Folio: 7; Page: 5 ; Schedule 27. [S1911] The 1911 U.K. Census was taken on the night of 2 April 1911. PRO Ref: RG14PN21184 RG78 PN1261 RD439 SD1 ED12 SN58. [S109] General Register Office - Index of Deaths, Q1 1933 Chapel en le Frith 7b 1185 aged 70 years. In the U.K.Census of 3 April 1881, William was recorded as residing at Public House, Longford, Derbyshire. In the U.K.Census of 5 April 1891, William was recorded as residing at Wolferton, Castle Rising, Norfolk. William Bull, son of John Bull and Mary Ann Housley, was married to Hannah Morley nee Goodall, daughter of John Goodall and Elizabeth Barker, on Thursday, 12 May 1898 at St. Chad's Church, Longford, Derbyshire. St. Chad's Church Marriage Register Entry - "Entry #301 - William Bull, 32, a bachelor, a Labourer of Hollington,son of John Bull, Farmer was married after Banns to Hannah Morley, Widow, aged 40 of Hollington, daughter of John Goodall, Labourer. William Bull, son of John Bull and Mary Ann Housley, died on Saturday, 16 November 1946 in Dragon Farm, Hollington, Derbyshire.11,12 William Bull was buried in St. Chad's Churchyard, Longford, Derbyshire, on Wednesday, 20 November 1946. Anecdote 'Mr Dickie was the Stud groom to the Cokes' at Longford Hall, he worked at Ardsley. When the Coke Estate was sold on Coke's death, Dickie sent for Will Wright and Will Bull, to be Stud-grooms, they both stayed at Sandringham for 7 or 8 years.' quote from Arthur Bull. Wynne Moore says that Will Wright fell from a cart at the Tutbury Show. 1916 - Kelly's Directory. Hollington, Commercial. Bull, William. Cowkeeper. [S107] General Register Office - Index of Births, Q4 1864 Ashbourne 7b 444. [S1881] The 1881 U.K. Census was taken on the night of 3/4 April 1881. PRO Ref: RG11 FHL Film 1341818 PRO Ref RG11 Piece: 3421; Folio: 28; Page: 9. [S1891] The 1891 U.K. Census was taken on the night of 4/5 April 1891. PRO Ref: RG12 Piece: 1567; Folio: 55; Page: 5 ; Schedule: 3. [S1901] The 1901 U.K. Census was taken on the night of 30/31 March 1901. PRO Ref: RG13 Piece: 3237; Folio: 73; Page 14; Schedule 30. [S1911] The 1911 U.K. Census was taken on the night of 2 April 1911. PRO Ref: RG14PN21022 RG78 PN1254 RD437 SD1 ED9 SN18. [S109] General Register Office - Index of Deaths, Q1 1930 Ashbourne 7b 776 age 72. [S1939] U.K. 1939 Register Transcription for England & Wales, Ref: RG101/5931A/010/30 Letter Code: RCAK. Schedule: 79 Sub-Number: 1. [S1939] U.K. 1939 Register Transcription for England & Wales, Ref: RG101/5931A/010/30 Letter Code: RCAK. Schedule: 79 Sub-Number: 3. [S109] General Register Office - Index of Deaths, Q4 1946 Ashbourne 3a 3 aged 81 years.